This is one of those mysterious records that I’m sure any ardent record collector will have several examples of. I have literally no idea where it came from – I certainly don’t recall purchasing it – and I don’t know who Tillmanns are, or why a release on Fraction Discs was something I’d be interested in. The record does come housed in a wraparound sleeve, which is often (in the case of records I own, at least) a signifier of some kind of indie pop. According to this review I just found, that seems to be very much the case. Because the internet is a wonderful thing, I can visit the URL on the back of the sleeve and, although it doesn’t tell me much beyond the fact that Tillmanns have other releases, I can then find my way to the Fraction Discs website, which makes it clear that the record label is very much a continuing thing, and that Fraction Discs is in fact a shop selling all kinds of indie pop releases. 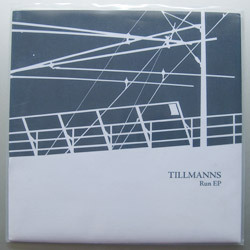 You could even buy this Tillmanns record from them, if you wanted to, for 45 SEK, which, according to Google, is equal to around £4.36. I like the artwork on this record’s cover. It’s a good use of a single-colour print*, setting up a graphic style which has an pleasantly abstract feel to it but which seems to carry some meaning. To me, this looks like the side of a large boat – does that make sense? According to the sleeve, the artwork is by Jörgen Svensson – possibly this guy, who looks to be rather a well-established Swedish artist. Well, a mostly single-colour print. The Fraction Discs logo on the reverse of the sleeve contains a tiny little red-coloured segment, which doesn’t look as if it was coloured in by hand, but is in fact part of the printing. I respect this: accepting the cost of printing an extra colour (which won’t have been insubstantial, in the scheme of things) to make sure that the logo is displayed correctly.